by Shannon Clark in Save Money, Top 10 | 83 comments | Contains affiliate links. 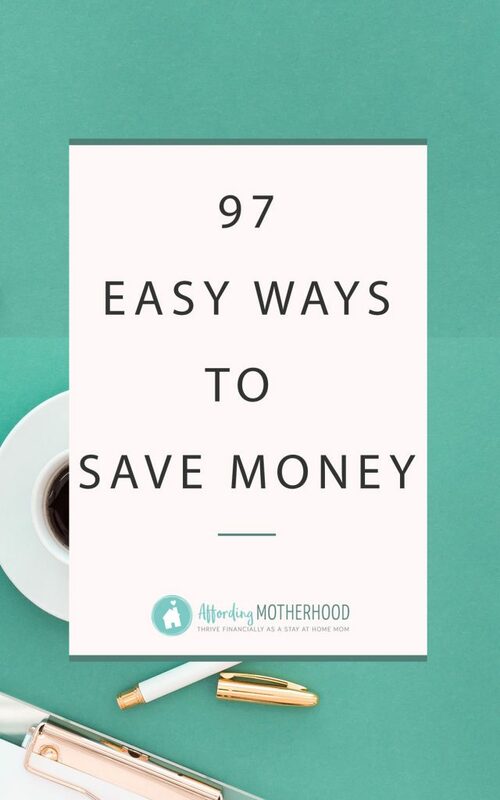 Try these 97 easy ways to save money on everything from groceries to health care, kids stuff, utilities, transportation, gifts, entertainment, and more! I first compiled this huge list of easy ways to save money in January 2014 when we were in the midst of our journey to get out of debt fast. We were living on one low income at the time, and I needed to figure out how to save money fast. At first, I didn’t feel there was anywhere else I could possibly squeeze our budget. Once I started looking, I found lots of ways to save money on a tight budget. Over time, I started adopting these money saving tips one by one, and I was able to make a much bigger dent in our debt than I imagined! Some of these ways to save might be new to you and others you might have heard before. What’s important is to actually DO what’s on the list! Don’t feel like you have to take on everything at once. If you’ve been searching for how to save money each month, commit to adopting two or three of these money saving ideas at a time. It really will add up as the months go by! 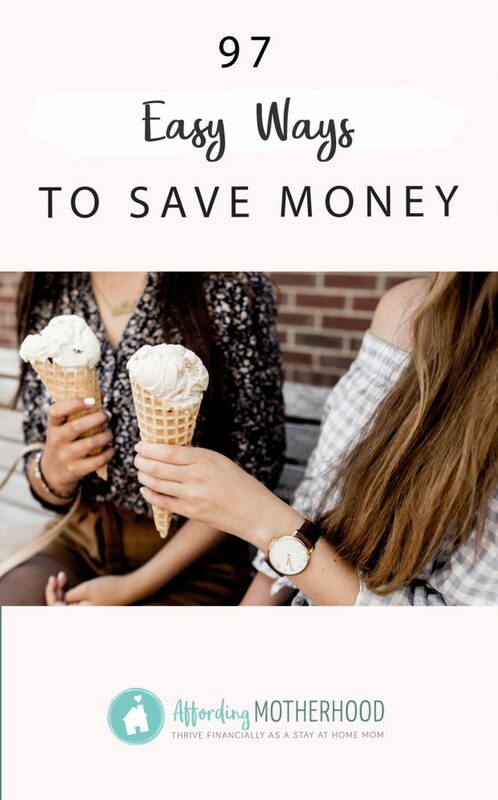 This list of simple ways to save money contains lots of links to take you to even more money-saving ideas and how tos and a few affiliate links to resources that I found helpful. 24. Creatively use whatever ingredients you have – Here’s how I spent just $170 one month to feed our family of four, in part by simply making use of what I already had in my pantry. 37. Look for recipes that are cheap to make – Here’s a list of 35 Cheap and Healthy Recipes with gorgeous food photos to inspire your meal planning. 51. Shop for a better deal on insurance, save $10-50/month – This one tip can save hundreds of dollars a year and really just takes a few minutes to do. Each time my insurance is about to renew, I call an independent agent to get a new quote. It takes just ten minutes and could free up a bunch of money to go towards your savings goals! 52. Move to a cheaper home, save $200-2000/month – Yes, I know moving isn’t that easy, but if the numbers add up it can be so worth it! When we moved we not only saved about 70% on the cost of our home each month but also we saved even more by moving to an area with a much lower cost of living overall. 53. Move to a smaller home – We lived in a small house for many years to save money and loved it. Here’s how we made it work for our family. 55. Replace plastic bags with reusable food containers – I also love these reusable pouches for saving money by making your own baby/toddler food. It’s a small initial investment but pays back within just a couple of weeks. 59. Use cloth diapers instead of disposable, save $50-100/month – This has saved use thousands over the years of diapering our two little ones. Here’s the exact cloth diapering system we use and love to save the most possible on diapers each month. 62. Buy only the necessities for a new baby – Here’s my minimalist list of frugal baby gear essentials, without all the extra stuff Target says you need! 63. Let your hair go back to its natural color, save $50/month – I’ve never colored my hair, but I did let it grow out long, so I don’t have to get it cut and styled as often. That alone saves about $10 a month. 64. Use cloth pads or a Diva Cup instead of disposable products, save $10/month – Ok ladies, this tends to be a somewhat controversial suggestion, but hear me out. After having used mama cloth now for well over a year, I would never go back to disposable even if it didn’t save me a dime. It’s so much more comfortable! You can save even more by making your own. I haven’t personally tried the diva cup, but I know lots of ladies who rave about it. It’s worth keeping an open mind on this one. 69. Take the bus, bike, or walk instead of driving, save $30-400/month – Living in Washington, we were blessed to live near a park and ride even when we lived in the country. This really helped save on the cost of my husband’s commute. There are also van-pools available where bus service isn’t. 80. Decorate for parties with what you already have. Bonus tip: Here are 100 different places that will give you free stuff on your birthday. 82. Go to the library instead of buying books, save $10/month – Our family loves the library! If you haven’t been in a while, check out my list of 29 free things to do at the library. You might be surprised at all the amazing resources they have far beyond just books. 84. Check out online consignment stores like Thread Up – You can also use these to sell your unneeded clothing to earn a little extra cash. You can buy and sell clothes for women, kids, baby, maternity, and accessories. 86. Don’t buy something just because it’s on sale! 96. Use the envelope system or sign up for free personal budgeting software – Here’s how I track my expenses. Even on a tight budget, by applying most of these simple ways to save money, we were on track to be out of debt within 25 months. Not too shabby, but once we got the ball rolling we were motivated to get done even faster! Here are a few of the more extreme things we did to save money and some of the extra income opportunities we were blessed to have sent our way. All in all, we were able to pay off our $22,047 in debt in less than 9 months! I pray that your efforts to save money will be blessed in the same way to bring you closer to your big financial goals as well! There are a lot of ways to save listed here, but I’m sure there are a bunch I missed. Share your best money saving tip in the comments below! Where can I send your free printable Ultimate Checklist of Easy Ways to Save Money? Excellent list! I’m happy to say we do a lot of these things already! Hooray! Re-use toilet paper, save $10 a month. I did the car insurance thing not too long ago and now we’re paying the same for six months as we were PER MONTH. I really wish I had done that sooner. Rose – sorry for the super late response! I agree. I will spent a little money on toilet paper. I get it on sale w/ coupons and stock up when I can . I don’t use paper towels,or paper dinner napkins soooo I spend on toilet paper. **I** happen to feel that toilet paper is GROSS!! I’ll take my bidet and cloth wipes any day, and even when we go on vacation!! I know different people have different opinions, and you’re all entitled to them, but I’ll never go back. For gift buying~ Don’t underestimate the dollar store! And they are not all the same, watch for the name. Example: Dollar General not everything is a dollar! At Dollar Tree, everything is a dollar. You can make so many great gifts for under$20. Buy a gift bag or a canvas tote there and start filling it. For a baby shower gilt with all the little things that you forget you’ll need, like nail clippers, comb and brush, pkg of bibs, onesies, baby oil, desitin, cotton balls, baby wash, shampoo, and maybe a few rattles or teething rings. Tissue paper and a bow..and that’s a BIG and useful gift. You can do wedding shower gifts, birthday gifts, mothers day,etc. I even did/do one for an Aunt and Uncle that are snowbirds. When they travel back up north they drive out take a train so I make up a bag with tons of things you didn’t know you’d need.Canvas bag, aspirin, Tums, sunscreen, gum or mints, bandaids, wet wipes, chap stick, note pad, pen, crosswords,a book…..be creative! And it’s always a big hit! We also do most of these suggestions. Try telecommuting if your job allows: cut on transportation costs (and office clothes). Probably saves on health care in the long run as well. I didn’t know about the discounted movie tickets at Costco. Thanks for that one! I wish we could cancel the home phone, but I still like having it for 911 Emergency calls so that first responders can easily know where we are in case of emergency. By law 911 must work even if there is no phone service. Just keep a phone plugged in for emergency. Family clothes…nasty.u got real problems if u can’t buy tp. So negative…Lots of families use personal cloths & I think u just posted to run someone else’s accomplishments down…Great blog & great tips…We’d all be better off if we tried just half of these ideas. Another way I’ve been saving money since I got my bank account at 18 is when I do use my debit card to pay bills online or use it in general (for the most part my hubby and I use cash for everything) I round up. It helps keep track of everything easier so you’re not keeping track of the change. for example if I spend $45.10 on something I round it up saying I spent $46. All that change adds up in your account. Same with deposits. Say I deposit a check for $100.25 I round down then and just say I deposit $100. The change adds up so fast it’s amazing! Like I said it also makes doing the math easier! Set a weekly budget, then try to beat it. Put the extra money back for an emergency fund. All great tips! Happy to say we already do most of these but I made a small list of ideas I need to work on! I noticed the entertainment section only had two ideas listed. I’m sure that is because one could go on for days on how to save on entertainment! We borrow movies from friends rather than renting or going to the theatre. We have friends over for a barbecue or bonfire instead of going out to eat. There are many creative ways to save money and still have fun! :) Thanks for all the ideas! Although I agree with most of what you have post but here are some thoughts that you should be aware of. – Most ma and pa restaurants are struggling. So if your family really cuts back, maybe eating out isn’t so bad. And if you do eat out, you can save buy going to happy hour or go where kids eat free. There are a lot of service people relying on tips and service at restaurants. – In Arizona, growing a garden could possibly be more $ than if you bought the produce in the store or from a local farmer. Between water rates and soil maintenance a head lettuce will be cheaper form another source. – DONT CANCEL YOU HOME PHONE for EMERGENCY PURPOSES. This will vary depending on state. Here is an example: When the recent tornadoes hit the cell phones didn’t work. Only the home phones worked. It would be better to save money by changing you cell phone plan. I selected a non-smart phone. I loved my smart phone but it is not a NEED to have a data plan. I can call and text from my phone. I saved $ on my bill. – Although we try to do a lot of our home maintenance but keep in mind there are a lot of small businesses out there that need our support. AND they know there stuff. I tried fixing a plumbing job and made it worst. Sometimes its better to let the “pros” to do their job. – I use tupperware containers but on an occasion I sue plastic bags and then clean them for reuse. Sometimes cleaning the dish cost more when you add up the water and dish soap. You will be surprised how long a bag can last when cleaned and reused. – If you buy gift wrapping paper from Hallmark or others stores, you actually save money than buying from the dollar store. If you average out the “size and length” of the paper — you will be surprised. I am all for cheaper. way to go. I like the after-Christmas sales – I especially try to get plenty of wrapping paper that is generic-looking so I can use it for birthdays. I get a really big roll of premium-quality paper for $.75. Amazing list of ideas.. 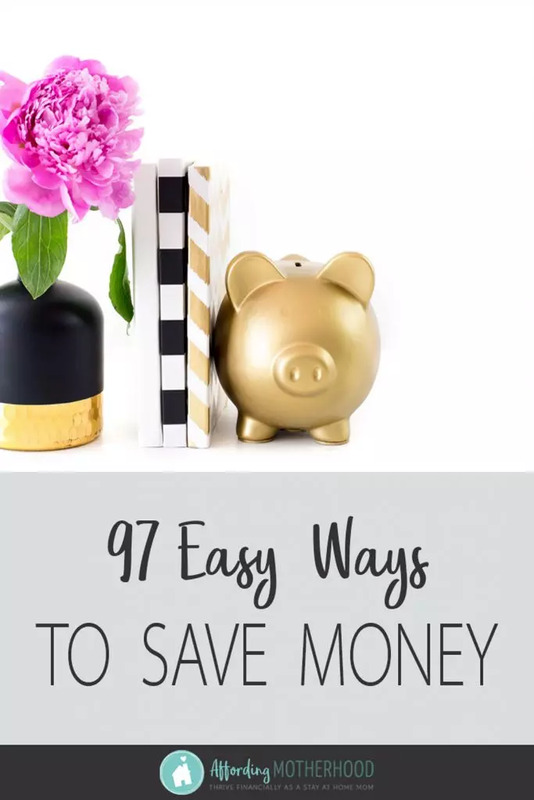 I got few new ideas to save more and I would really work on shopping because I am big shopping addict.Thanks for sharing this money saver tips. I understand the cash over plastic rule. However, we MAKE money by using our credit card. Both of our cards give us cash back. We charge pretty much everything and then pay the card off at the end of each month. No exceptions. Obviously you have to be the kind of person who can stick to a budget, of course, and NEVER carry a balance. Our credit card pays us $5-600 a year! I used to have the same reasoning, but to get $500 back on a 1% reward card you are spending 50k a year! I switched to cash and spend $500 less a MONTH- which is so much better than my old rewards. Swiping is so mindless and easy it’s so easy to buy a little more here and there. I always encourage anyone I talk to to try cash envelopes and see the difference for themselves. Anyway, thanks for a long and thorough list! Do you have a university in your area or a 4H club? I know our university has a agriculture department and they sell the livestock a couple times a year. Sometimes if you buy a cow or pig from 4H or FFA you can split the cow/pig with a butcher and get the butchering for free. What a great way to save money Jenny! Thank you for adding this to the list. BettySue, my heart goes out to you. It’s hard to get ahead, but you have to focus on spending less than you make. Really keep track of your spending and bills. Know what you earn also. You may have a problem with income rather than out-go. use the food grade wax paper liners in cold cereal boxes to store food instead of wasting clear plastic wrap. That’s a new one! Great idea! We don’t buy cereal, to save money, but if you do, that’d work great! what cloth sounds very scary! One thing that isn’t mentioned because it probably doesn’t fit into a category or belongs in its own: tithing! It’s probably not the most popular money-saving tip, but it works! My husband and I have tithed at each church we’ve been members of, and God has always provided for us. We’ve never had a lot of extra money, but sometimes we do for a vacation or something fun, and we’ve always had our needs met, which is all I’ve wanted anyway. Each time that I forgot to tithe or tithed the wrong amount, we have struggled a little more financially. God keep his promises! If you’re obedient, God blesses you for your faith, even when the numbers don’t add up. Love this reminder! We have seen the same miraculous provision, particularly when we committed to following the call to get out of debt and when we began tithing. I agree wholeheartedly about thithing!!! Run your appliances like washer/dryer and dishwasher during non-peak hours. Not all, but many utility companies will offer discounts or charge less to run this appliances during non-peak hours. Those hours are typically 7pm to noon the next day. After this, it becomes peak hours because these are the times when most people are running these appliances. The main peak hours are 2-3 pm. Check with your local utility company to find out the peak and non-peak times. Some people have estimated nearly a 50% savings on these appliances, but of course this will all depend on your utility company. I did believe it but unplug those cords from electrical sockets. #4-Besides Azure Standard, depending on where you live, you may also be able to order bulk meats, etc. from Zaycon Foods (www.zayconfoods.com). They usually have great deals on hormone-free meats and you can stock up, put it in the freezer, can it, etc. Thanks for the great tip! I’ve heard great things from others about Zaycon, but I haven’t tried it myself. I will have to look into it! It sounds like a wonderful resource! Thank you! Love this incredible resource, Shannon. Thanks so much – pinning this! We recently joined a local gleaning organization. For a small monthly fee, I can shop from produce (often organic too) and groceries donated by local stores and farms that may be just a little past its prime. In season, we also get to glean produce from local farms. I’m just starting to calculate how much we save, but I’m guessing its about $150 a month. Thanks for this resource, there’s a few ideas in here I’ll start trying. Great advice! I was amazed last year how much of a yield I could produce in such a small space. I planted 12 pole beans (bought the starts from the local family-owned hardware store) and we ate beans a minimum of twice a week and gave some away from June through September. Wish I had noted what variety they were! I think they probably produced 3-4 lbs per week. For everyone freaking out about the reusable cloth, calm down. You can use it just when you urinate not for bowel movements. And then put them in the washing machine. All of us women know that our men aren’t using tp when peeing but we definitely need tp to wipe. It’s a small change and you can save money without getting rid of tp completely, but you will be cutting back substantially on the amount used. And they are easily washed. It’s not that gross in all actuality. Open your minds. Plus, it’s super helpful for the environment. I know! I don’t do this, but I know some people who do. The lady I know has her family use them all the time. they drop them into a diaper pail with bleach water. Every day or two, they wash them separate from everything else on HOT water with bleach. What’s scary? Check out movies at the library instead of renting them. Free is still cheaper than cheap. Also when you stop smoking you save more than just the cost of cigarettes! You can hang up at least some clothes to dry, look into making your own laundry detergent, unless that is covered by food stamps? Make your own household cleaners using vinegar, citrus and baking soda you can easily google DIY cleaners for how to use these things. Do you pay for your water or electric bills? Find out where your food pantries are. Check the churches in your area as well. I wrote info on that in the reply section. Check your local library for freebees( I get free coupons there I give the diaper, pet and ‘women’products ones to those that need and use them) Pray don’t give up hope! Great list- Also you can sometimes save money by calling your utility company or cable company and get a deal. We no longer have cable but they always had promotions going on. I also saved recently by switching internet companies. That alone saved me $50 a month. I was going to switch trash removal companies because my current one kept raising the price and when I called them they actually gave me the price I had when I first started using them 5 yrs ago because they didn’t want to lose my business. That saved me $50 per quarter! Our electric company also has an energy saving program that you can evaluate how to save energy and they sent us free energy efficient light bulbs and tips on how to save money. We also are aware of what appliances give off the most energy and never run those appliances at the same time. For instance the dryer, stove & AC. When I am cooking I shut the AC off- I do my cooking earlier in the day if it will be hot out. I also don’t run the dryer while I am cooking. Little things like that can really make a difference! Great tips! It really is amazing how much money you can save just by taking the time to pick up the phone and ask. I wish we had more than one internet company or garbage service in our area! Though, I bet you could decide to haul your trash to the dump instead of having it picked up. Thanks for the tip! I have seen a couple different blog posts about saving money on cell phone service, and I would love to explore some different options. Drink water from a Britta filter instead of buying bottle water. Saves plastic and saves money. We live in the Seattle area where it rains a lot, so a rain barrel system is a good money saver and very common around here. Also, we only go grocery shopping once every two weeks. Just avoiding the grocery store saves money on impulse purchases and gas to get there. Buy some produce that lasts longer before spoiling and use that the second week, stuff that spoils faster gets used the first week. Can you tell me a little more about how the grocery saving program works? I’m interested, but our budget is extremely tight right now and before I pay $37 I’d like a better idea of whether I’ll really utilize it. Very nice tips. Thank you for sharing them, I will definitely go try some of them. We cut old T-SHIRTS shirts into squares and use them for cloth napkin. I get about 8 from and adult-sized shirt, and I feel like they’re a more logical size. Great tips. We do a lot of these already, but there’s always more places to cut & save. Personally I’ll always buy toilet paper. I get it $15 at Costco and it lasts my husband and I FOREVER. Don’t agree with buying wrapping paper at the dollar tree. Cheaper wrapping paper always equals less wrapping paper, you’ll have to buy lots more than just one roll. Just buy the thick $5 rolls from Walmart and you’ll easily be able to wrap lots of presents. My parents actually don’t use wrapping paper. They bought nice thick boxes years ago and still use them to put presents inside. Then they keep the boxes year to year. They also like to use boxes from random things they’ve gotten or bought to put gifts in. Makes you think it’s one thing when you see it but it’s really something totally different. I love the idea of reusing boxes. Great idea! ThredUP I made over $1,000 last year selling clothing, boots and designer handbags. Thanks for sharing! Switching from disposable paper products helps a lot! This is such an awesome list of so many different options! I’m sure we’re all guilty of some of these so it’s great to know anyone can apply these tips. And can start today! Great list! We forget how many little things add up to big things. I often buy things in bulk at Sam’s Club and save so much on things like paper towels, toilet paper, cleaning supplies, and pet supplies. I just have to make sure I spread out those Sam’s Club purchases so they don’t happen all in one month! Don’t buy unless you can afford it, don’t let money burn your pocket hold on to it. cut lights off unless your using it. Don’t spend money unless you actually need something.